When I phoned the press office at ExCel to ask whether ‘freelance’ journalists were allowed entry to the arms fair—or ‘Defence Systems & Equipment International 07’, as it’s officially called—I was told by a reassuringly callow gentleman simply to turn up with ID and a few articles I’d written. This was too good to be true, but being an optimist I went along anyway. The Beckton branch of the Docklands Light Railway was heavily policed; I alighted at Prince Regent, weaving between officers and stewards towards the accreditation tent with an apprehension probably induced by Mark Thomas’s claim in the Guardian that he’d been body-searched at the event for ‘appearing over-confident’. I had neglected to actually tattoo the word ACTIVIST on my forehead, but the art publications offered as press credentials perhaps amounted to the same thing. Jayne Thomson, press officer for the defence and aerospace marketing company CMS Strategic, perused them sceptically while I explained that I wanted to write an article comparing arms fairs with art fairs. ‘This is not an arms fair, Mr Ashton; it’s a defence systems & equipment exhibition,’ she replied bluntly, ‘and entry is restricted to national media journalists, the military and those directly involved with the defence industry.’ I have to admit she was good, was Jayne, seizing on every terminological blunder and turning it against me, supplying the correct words whenever my knowledge of the marketing of corporate death mechanics faltered. I switched the subject to art. Was she aware that Frieze Art Fair was imminent? Did she not think that a comparison of military and cultural commerce would be instructive? And did she know that a home-made nuclear device had once been exhibited at the Saatchi Gallery? Sure enough, the subsequent news coverage of the arms fair sharpened my regret at having missed out—for the range of equipment on show had, as I suspected, a diversity reminiscent of that found at art fairs. This diversity is arguably the culmination of an equally eschatological project, of a century of formal expansion, modernist reductionism, conceptual dematerialisation and eventual postmodern ‘replenishment’: the net gain, firstly, of a deconstruction of art’s ontology, and more recently of what we might call a post-avant-garde vocational imperialism. That is to say, where art once appropriated objects, it now appropriates vocations—Mark Dion’s use of archaeology in ‘Tate Thames Dig’, 1999, and Joe Scanlan’s use of horticulture in ‘Pay Dirt’, 2003, being notable examples. Often missing from the discussion of such work is a critical voice from the perspective of the particular vocation invoked. In the 90s, the American artist Gregory Green’s way around this was to adopt the vocation of the outsider—specifically, of a bomb-maker. 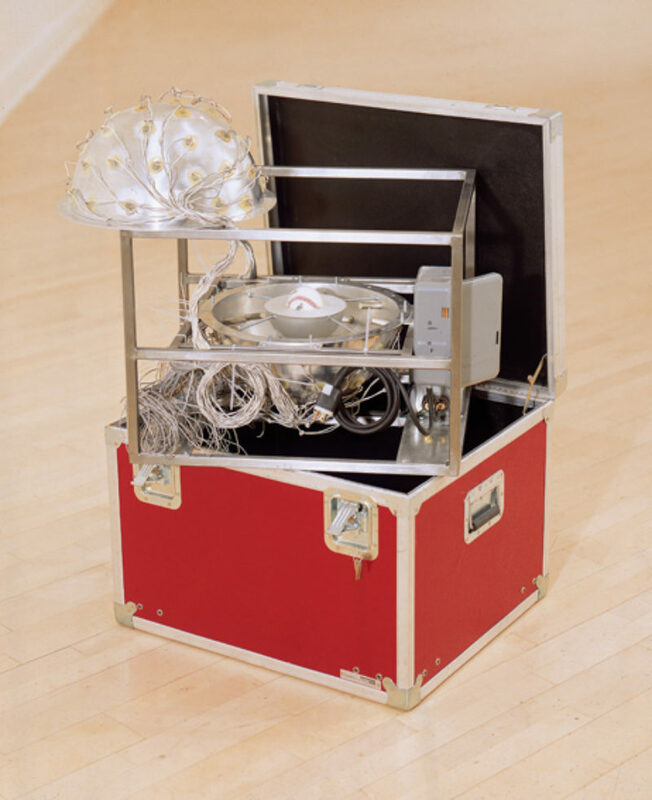 His ‘Nuclear Device’, shown at the Saatchi Gallery in 1996, was reportedly examined by bomb experts, who confirmed that the only thing it lacked was explosives. As a Charles Saatchi acquisition, it came to symbolise the Great Accumulator’s power over the art market, his capacity for causing auction-house-apocalypse by flooding it with work at any time: its potency was thus easily co-opted into left-wing diatribes that engaged only fleetingly with its author’s critique of subjective empowerment. Perhaps its commercial dissemination required greater forethought. Imagine how much more potent ‘Nuclear Device’ could have been if it had been shown, say, as an edition at an art fair, where its availability for purchase by, in principle, anyone—as opposed to its entrustment to a single custodian—would have given the artist’s critique of empowerment a more democratic dimension. On the subject of editions, there was much anticipation surrounding Richard Prince’s commission for this year’s Frieze Art Fair, ‘Untitled (Original)’. Prior to the fair, there appeared an interview with Prince in Modern Painters in which he described a fully functioning model of a 1970 Dodge ‘Challenger’, fabricated from the shell of an original and boasting ‘a 660 hp Hemi engine, custom interior, black wheel wells, 14-inch tires in the front and 16-inch in the back, a pale orange paint job with a flat black T/A hood, plus various decals and emblems.’ This artwork, he added, ‘will of course be completely drivable and in an edition of three, all for sale.’ Moreover, should the collector’s car break down, develop a fault or get damaged, then the artist will repair it in his personal body shop. Although Prince’s contribution to Frieze was one of these editioned models, currently he seems to be treating it as an artist’s proof, for according to the curator of Frieze Projects, Neville Wakefield, it is ‘his personal car—he drives it round’. Given what we know of Prince, the presentation of this work on a revolving platform with a woman polishing its bodywork and posing for photographers was to be expected, but this promotional rhetoric is less interesting than its commodificational ambiguity. For example, how will its insurance as a vehicle relate to its insurance as an artwork? To insure any of Prince’s works is doubtless expensive; to insure one that can be driven at high speed on a state highway is presumably more expensive still. Furthermore, contemporary artworks are often so logistically complex that the restoration process invariably begins the minute they leave the studio. The line between initial production and later restoration has never looked finer (many works simply being remade whenever they are shown), and the nomination of a car as an artwork—one that you are encouraged to actually drive—magnifies this capricious materiality. Sports cars are always going wrong; what if the collector decides to entrust the maintenance of his ‘Challenger’, not to Prince’s technical team, but to some local grease monkeys instead? Will amateur restoration affect its provenance? Is the vehicle history certificate to stand as a kind of provenance? As a readymade, Prince’s ‘Challenger’ doesn’t quite fit in the ‘unassisted’ or ‘assisted’ category, relying neither on mere displacement nor the physical manipulation of a displaced object. Rather, it exemplifies a third, post-Duchampian category of readymade: the work of art designed, made and marketed as a product. Duchamp introduced the idea of an aesthetic parallax—the apparent ontological shift of an object when seen from different contextual viewpoints. As the ultimate object of mobility, Prince’s car emphasises the one thing about this mechanism that we willingly overlook: that the passage from the quotidian realm to the realm of art need not be a one-way ticket. His ‘Challenger’ issues an open return, the possibility of moving back and forth between transcendent and quotidian realms as and when the artist (or collector) dictates. Readymades share something of the language of transubstantiation—the object’s appearance remaining the same, but its essence changing according to the metaphysical ‘liturgy’ imposed by the artist in its transition from concrete to transcendent states. When Prince’s ‘Challenger’ is handed over to a collector, he then becomes the executor of the liturgy: artist becomes driver. But if the driver presents the vehicle for routine inspection in an art context (at future art fairs? ), he defers once more to the artist. Together, they comprise a sort of dual authorship of the work: Prince effectively sanctions the gradual effacement of his signature by that of the driver as the initially mint condition vehicle depreciates and becomes more ‘real’. But before we get excited about this work as sacrament for consumer society, we should consider how its concrete/transcendent simultaneity is to be made available to viewers in a more than metaphysical—ie experiential—sense. Usually, readymades of this genre, having been launched with great fanfare, tend to disallow appraisal of subsequent functional application: like renegade missionaries, they state their objectives of creating an outpost for art in the quotidian realm, and then disappear. Perhaps Prince’s ‘roaming’ readymade will counter this. Some regard its appearance at Frieze as a stunt designed to annoy those who say that art fairs can be critical; more likely it is the culmination of a process that began with the artist reattaching some of the paintings from his ‘Car Hoods’ series, 1987-2002, to actual vehicles (ie pressing transcendent objects back into utilitarian service). For Prince, the distinction between commercial and critical modes has never been a precise one. Neville Wakefield’s commissions for Frieze Projects are similarly speculative, attempting ‘to occupy both ends of the spectrum either with interventions that are immaterial or spectacles that are so material that they interrogate the high octane salesmanship of the fair’. That something can interrogate ‘high octane salesmanship’ merely by virtue of being ‘material’ seems simplistic, as does the strategic counterbalancing of materiality and immateriality—which sounds like an insurance policy against the perceived vulgarity of commerce. Nevertheless, such a statement at least lays bare the psychology of art fairs, in which so many artists participate while bemoaning the banalising effects of cultural capitalism. This ambivalence often leads to a kind of bourgeois activism, to projects in which artists acknowledge a discomfort with their own sense of complicity. The Chapman brothers excel at this. Their caricatures of collectors in Frieze ’06 and their defacement of banknotes this year—both satires on the notion of supply and demand—rely on the gullibility of a certain reviled, but curiously ungoadable, demographic. Their exploitation of the Botox Set is warmly misanthropic: how they love to make them queue, to see whether their patience matches their credulity. One of the ‘immaterial interventions’ referred to above by Wakefield was Kris Martin’s commission. At 4pm on the opening day of the fair a public announcement requested everyone to stand still and observe a one-minute silence. Some people obviously didn’t hear the announcement, emerging from the toilets and bowing their heads instinctively in respect for the dead. Who did they think had died? Larry Gagosian? Richard Branson? Donald Trump? Those who had heard the announcement continued talking, projecting their voices in provocative fashion at this abuse of their statutory consumer rights. Towards the end of the silence came my favourite moment of the fair. A guy’s mobile phone rang. He answered it. What did he say? He said he couldn’t speak right now—he was observing a minute’s silence. Isn’t the 21st century fantastic?